So, all of us with teenagers have probably hoped, at least secretly, that our kids are not engaging in the time-honored tradition of spectatorship at the submarine races… I know I have. Never did I expect that one of mine would actually attempt to enter the race, in a vehicle intended only for dry land. Yes, that silver Explorer darn near made it into one of the tributaries of Melton Hill Lake last Friday afternoon. Beta, on her way to work at Big Ed’s from her apartment in Knoxville, was cruising southbound on Melton Lake Drive when she fell asleep at the wheel. At 4 in the afternoon. Rush hour. 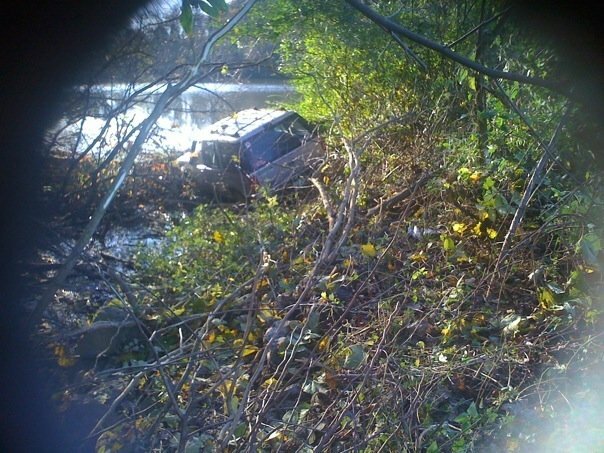 She crossed a lane of oncoming traffic, just missed a row of vertical railroad ties, traveled nearly 100 feet on the wrong side of the railroad ties along the top edge of a gully, then veered off toward the water. She called and told me she’d fallen asleep while driving, and asked me to pick her up. She didn’t say anything about the truck being in the lake, or anything like that… I guess I assumed that she’d been pulled over for weaving, and the officer wouldn’t let her drive. She’s okay. Her dog (riding in the back seat) is okay too. The Explorer — yes, that one — is less than okay, but upon close inspection in the daylight, probably isn’t totaled. On Friday evening after a wrecker towed it home, we thought the frame was bent, but on closer inspection in the daylight, it’s not. There’s a cross-rail that is mangled, the front axle may have to be replaced, and some mounting pieces that nearly sheared off, but those are all things that can be found in a junkyard. There’s a window busted out, the driver’s side rearview mirror sheared off, but those are replaceable. HWTFM and I went back to the scene of the crime on Saturday, and picked up several pieces. The kid is lucky to be alive. It’s a wonder the truck didn’t roll. She’s lucky she didn’t get thrown through the windshield (with no seatbelt on). It’s only now that I can actually think about it, write about it, without shaking. Maybe a few weeks without wheels will be a good thing. THURSDAY UPDATE: Yes, it really is totaled. Our mechanic said it can’t be fixed. 7 comments Monday 09 Nov 2009 | Netmom | Etc. Fever, chills, congestion… and a general feeling that some evil elf came along and beat me all over with a big stick: sounds like the dreaded “flu-like illness” that’s been making the rounds in the last few weeks. Since I’m not in any risk categories and likely have at least partial immunity from decades past, I have just ridden it out the old fashioned way. Aspirin, lots of water and orange juice, a little hot tea and soup, is about the best one can do. Today is Day 4, and the fever is gone. At this point, I’m just left with that “hurt all over” feeling… like I’ve skied really hard for several days, or completed a 50-mile bike ride. But I haven’t done any of those fun things. All I’ve done is lie in the bed. I don’t know where that big, ugly bruise on my left foot came from, but I hope it’s from kicking that evil elf to the next county. In retrospect, it wasn’t nearly as bad (for me) as the media hype, and I’m glad to have gotten it over with. Years ago, just out of college, I worked for the Knox Co. Health Department, where I was sick for most of three years. Although I hated it at the time, I’ve become thankful over the years since that I did build up a pretty healthy immunity to the stuff that my kids inevitably brought home from school. I’ve been through at least five different bouts of kids home with the flu, without catching it. A little over a week ago though, HWTFM came home from Pantex and fell ill within a couple of days. Luckily, neither of the younger kids, still at home, have caught it. Yet. The fear of the flu — at least for those of us without complicating conditions — is much worse than the real thing, in my opinion. It’s not fun, but it’s not as bad as the hype. 3 comments Monday 05 Oct 2009 | Netmom | Etc. Father’s Day was fun, as we had all the girls home for the first time in a while. It’s interesting to see how they’ve changed, what they’ve learned, as the older two transition more to living independently. They’re still welcome here of course, but they’re growing up and leaving the nest for increasingly longer test flights. Alpha is home for a few more days, between the end of school and her summer research project at Cal State. Beta is sharing a duplex out in the boonies with two friends, so she’s truly experimenting with independent living over the summer. A week ago, we finished up the Explorer project, so Beta is mobile again. Although it took an entire frustrating year to finish (with months off during the colder periods), it runs really well. She’s happy. I’m happy. An interesting comment from Beta yesterday: “Wow. I forgot what it was like to have soft toilet paper… that stuff’s expensive.” First-apartment living with a degree of independence is a learning experience, and it seems that they’ve developed a bit more appreciation for where money comes from, and where it goes. Everyday items, like soft toilet paper or a gallon of milk in the refrigerator, are seen in a new light. They’re growing up. Gamma is experiencing her first regular job, as a lifeguard at the municipal pool. She loves the work, and on Saturday, had her first “save.” Thankfully, it was an easy one — an elementary-age boy who’d gotten in over his head and was struggling. I have to hand it to the City of Oak Ridge: the training and expectations of their lifeguards is first-rate. Two weeks ago while HWTFM and I were picking up a washer and dryer for Beta (she bought it, we just transported it), his GPS was stolen from his truck during a brief stop at a store on Clinton Highway. He was devastated — I’d just gotten a replacement under the warranty, because the first one was broken during a business trip in May. Beta really stepped up to the plate and suggested to me that she and her sisters split the cost of a new one for him, for Father’s Day. Since three of the four are working, it worked out. He was really surprised and pleased. Now, if only I can get Delta off the couch a bit more (facilitated by taking away her wireless adapter and ethernet cable), I’ll call it a successful summer. 2 comments Monday 22 Jun 2009 | Netmom | Etc. A month or so ago, HWTFM’s laptop developed a bizarre problem of randomly shutting down, usually during the boot process. Since it was out of warranty, he decided it was time for a new one, so the old one sat around on the kitchen table ever since. Now that summer has arrived, I have a little time to tend to things around the house that need fixing. Last week, I took apart the old laptop. I didn’t actually FIX anything, but what appears to be the ritual “laying on of hands” probably includes snugging up connections that have worked loose over time. Also removing gobs of cat hair, attracted to the inside of anything electronic because of the electrostatic charge. But even after I was able to get it to boot successfully several times, we were still stuck: HWTFM had forgotten the administrator password (the only account on that machine). I tried 437 times to guess at it, then gave up. This morning, after again fixing Delta’s laptop via the “laying on of hands” method (it was her keyboard cable), I started googling for an XP password crack. There are several out there for $34.95-ish, but I wasn’t in the mood to spend money. Finally, I happened upon the Ultimate Boot CD, which contains quite a few excellent tools, including a password reset. That’s how I know I tried 437 times to guess: the password reset tool told me how many times the incorrect password had been attempted prior to my reset. The utility also includes a variety of hard disk tools, partition tools, a registry editor, anti-virus and anti-malware tools, and a bunch of other stuff. MOST people probably either remember their Windows password, or just don’t use one. But occasionally one is called upon to fix a machine where the password is unknown, or even one that was changed via malware. This tool isn’t for rookies or the faint of heart, but it’s a good one if you can follow directions and sort of know what you’re doing at the command line interface. Next up, I’m running a full scan on the old computer, because I’m suspicious that that’s how the password got messed up in the first place. Once that scan is done, then we’ll have one more working laptop in the house, probably destined for Gamma going into her senior year of high school. Another nifty freebie: BurnCDCC from TeraByte Unlimited is a small, fast ISO-burner to create bootable CDs. If only I were as proficient in auto repair. 3 comments Thursday 11 Jun 2009 | Netmom | Etc.